On Friday evening, April 5, the MCHS students in the two advanced choirs, Chamber Choir and Bel Canto, were joined by the Voice of Chapin Choirs as well as the Newberry College Singers for a combined concert. 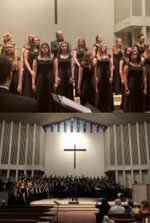 The choral students of Mid-Carolina performed their music from Concert Performance Assessment as well as two combined pieces with the students from Chapin and Newberry College. Students from Mid-Carolina were chosen as soloist for the joint pieces, Hailey Roach, Isabella Perez, Alice Montgomery, and Anna Wicker. These students performed beautifully and represented Mid-Carolina in the BEST way! Congrats! !